Unity, the official beer of LA Beer Week, will officially be unveiled at 5 p.m. Friday release party at Three Weavers Brewery in Inglewood. 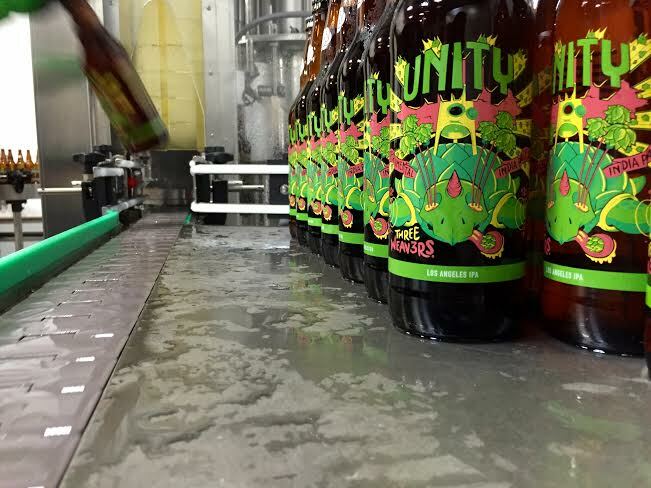 Unity is a collaboration between members of the LA County Brewers Guild and its annual creation — the beer can be quite different, but boasts the same name each year — rotates among members of the nonprofit. This year’s version uses an experimental hop so new it doesn’t have a name, said brewmaster Alexandra Nowell. The 7.4% abv brew has “bright notes of lemon zest, stone fruit, and a satisfyingly resinous finish,” she said. San Francisco-based artist Nick Fullmer, known for his craft beer label artwork at Sacramento’s Bike Dog Brewing and others was given free-rein to create the funky label. Unity’s official release party goes from from 5 p.m. to midnight Friday. A full lineup of Three Weavers beer will be on tap and a special art exhibition of Fullmer’s work will remain on display through July. LA Beer Week starts June 18. This entry was posted in Beer events, LA Beer Week, South Bay breweries by Nick Green. Bookmark the permalink.